The temperatures are dropping, but that won’t stop an avid angler like you from getting out on the water! 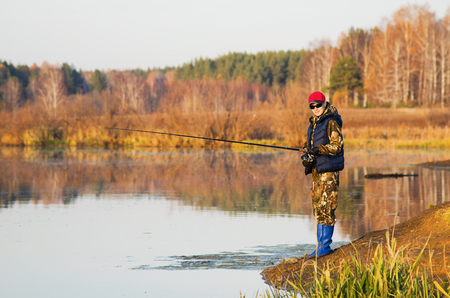 If you are planning a fishing trip for these colder seasons, be sure to heed our tips to help you stay warm while hitting the open water. It’s a no brainer—of course you’ll be dressed for the weather as a true outdoorsman would be. However, it’s all about dressing intelligently. First, swap out the cotton for a more synthetic material or perhaps wool; something that wicks away sweat and water easily. Next, think in layers. You want to keep all of the heat you can inside, so Under Armour should be a necessity since the material is made to trap in heat. After that, think about comfort and how you will strive to stay dry. With layers, you can remove them if the day grows warmer, or replace outer layers if you happen to get wet. Your feet, hands, and head will be at the mercy of the cold weather, and they are also the areas that you need to retain a good feel in. Be sure to equip yourself with gloves, a hat, and thick socks so that those extremities stay nice and toasty while on your trip. We mentioned it before, but this is essential when out on the water. Any moisture can make you feel chillier than the actual temp outside. Try to utilize waterproof gear and other outdoor clothing options to avoid getting wet at all costs. When you’re warmly dressed and have your gear ready, look to Mattice Lake Outfitters to plan your winter fishing trip! Give us a call at 1-800-411-0334 to learn more about booking your stay!